For many people, the season of Spring is a call to get their cleaning done so they can get outside and enjoy the beautiful weather. For home owners, Spring is an opportunity to take care of the TLC needed on their home prior to selling. Regardless of the time of year, here are 10 ideas on how to up the value of your home, so that when you sell, you can make more money whether it be in the dead of winter or under the hot rays of the summer sun. 10. Turn up the Lights! In Oregon, our weather likes to challenge itself to see how many seasons it can fit in one day. Yet when that sun comes out, it makes every Oregonian giddy, even if it is still 50 degrees. That natural light flowing through a home is something that not only saves energy on an electricity bill, but adds a boost of Vitamin D energy to its inhabitants. So how does one improve this in their home? Take a minute to look at the flow of your home. Is the layout closed off to where light can’t get through? Maybe there is an area where a wall could be removed to open up that flow. If taking out sheetrock doesn’t sound like much fun, adding windows or skylights to let light in is another great option, as people love to be able to look out or look up at the beautiful Northwest skies. You don’t have to be a parent to dislike the rigorous attention required in maintaining a perfect shade of beige in your carpet. Daily vacuuming, steam cleaning, an overabundance of coasters for those who dare to bring drinks onto the sacred carpet….it can get tiring and frustrating. Don’t get me wrong, there are many benefits to carpet, such as tired feet sinking into plush fibers after a long day of work. Let’s be honest though. Hardwoods, while also requiring their own amount of care, tend to be a little easier to keep up, and last longer. They lend a sleek feeling to a home, can be dressed up with a gorgeous rug, or finished to the point of gleaming. Kid spills something on the wood floor? No problem! Easily cleaned. While I have met people who prefer carpet over hardwood as well, most buyers tend to at least like a blend of wood and carpet, wood primarily being in the entry ways, kitchen, and dining areas. This one is kind of a no brainer. If it doesn’t look appealing on the outside, you may not get as many people to check out the inside. Some easy ways to up curb appeal: Make sure your siding is in good condition, and that the exterior paint is not worn in any area. Gutters need to look good, although in Oregon it isn’t horrible to see something in them. We do get some strong breezes, so there is bound to be some kind of leaf in there. How does your driveway look? Is part of it raised up from a tree branch or something? That may need to get fixed if it is affecting the way people are able to enter it and park. How do the shrubs look? Are they trimmed nicely? Adding plants such as perennials which are easy to maintain may help curb appeal. 7. A room just for the Sun?? This may sound crazy as we get 3-4 great months of weather in the Portland area, yet adding a sunroom can help up your value. Especially if it is an enclosed (maybe heated)sunroom. Why? Simple. Say you add a sunroom off of your living area which is close to the kitchen. It creates an open feeling when people entertain as it creates an overflow area for visitors. Not only that, but it creates a relaxing place for an owner to be to watch the sun rise, the rain fall, or the heat start to creep in. Some people enjoy sunrooms as places they can let their pets relax for a bit without having to send them into the cold or muddy outdoors. Continuing on the outdoor theme, a deck is a wonderful addition to a home. You can play around with shapes, add a built in fire pit (although check city code before doing that), built in benches… so many options! It really ties back into that love of being outdoors. When the weather is nice, people love to be out. Creating a space where you can sit on vibrant patio furniture, BBQ with friends, watch the kids play, garden. It gives an owner another place to relax and live. It sounds so simple, and I think that is because it is. Fresh paint gives new life to a room, and a potential buyer may love the fact that they won’t have to do it after closing. It used to be that people tended to play it safe with the neutral colors, but this is not necessarily the case now. Don’t be afraid of color! Have fun with it, but make sure it is realistic (don’t color your walls like a highlighter or puff paint it like a Lisa Frank binder), fits the period of your home, and is finished well. It doesn’t have to be done by a professional, but people will notice if there are gaps in the paint, if the walls aren’t primed, or if it looks like a 5th grader did it. This ties in with Curb Appeal in that a lot of the same ideas are relevant. Don’t over do it. People will notice if a yard looks jumbled, and may get scared off by how much they will need to maintain. Or they will just pull it out after they move in, which wastes the money you spent. Keeping it simple, spacious, and easy to maintain are the best ways to go. If you add plants, make sure you add things that don’t need a ton of water or upkeep. Pops of color are wonderful, but try to find something that doesn’t die quickly. Keep the yard free of debris, such as excess yard tools or toys so that people can really get a sense of the space in the yard. Why spend the money to finish a basement? Revenue. There are so many uses for a finished basement that it is hard to know even where to begin. You could create a rec room, a “man” cave, a craft room, a bar, a media room. Is your basement accessible from outside the house? Many buyers today have family with different needs that they want to have stay with them, or look to be landlords by renting out the extra space. You don’t have to go overboard and decorate or put top of the line fixtures in, simply have an up to code finished space that a buyer can make their own. Have you ever been in one of the ranch style homes that have the original bathrooms? They tend to be small, and not abundant in number. Apparently the 2.5 bathroom concept wasn’t a huge thing in the ’60s or ’70s. Now we have more product to store, more scents from Bath and Body Works to hide, and the extra storage is useful. In all seriousness, the value in adding a bathroom or remodeling an existing one comes in eliminating a cramped space, in being able to relax in a soaking tub or dual headed shower, or having a full bathroom on the first floor that grandma or visitors may access. It doesn’t have to be a huge change. 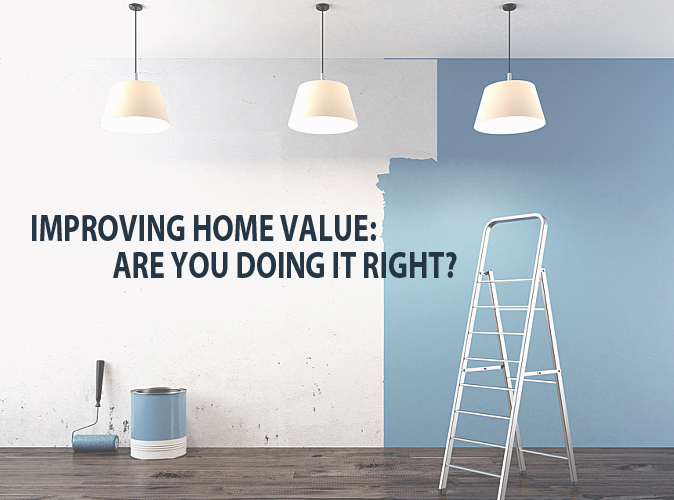 Updating lighting or fixturing, fresh paint, refreshed cabinets, all of those things help create value. Channels like the Food Network make us feel like we can cook anything, but before we can channel our inner Giada or Bobby Flay, we need a kitchen that is up to snuff. While the Harvest Gold of years past carries a limited amount of wistfulness, more and more buyers are preferring homes that come with granite or quartz counters, good counter top and cabinet space, open layout to where they don’t feel they are in the galley of a ship. Who doesn’t love islands in the kitchen? Especially when they have outlets? More area to meal prep, to bake with friends and family, or to eat at when you have the space to add some barstools. Some other factors to consider when remodeling a kitchen for value are having coordinating appliances that are in good condition, and light! Remember how we talked about letting that natural light flow in? Having those windows and skylights can help make a difference in how someone interacts with a home. Overwhelmed? It is a lot to take in. You may not even need to do a lot of these depending on the state of your home. This is where having your realtor do a walkthrough comes in handy. 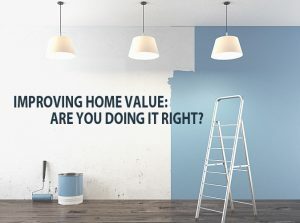 We can help assess what your current value is, and what cost effective things you can do to help net the most money in your sale. What items on this list hit home for you, and were there any areas missing that you were thinking or hoping you would see? What features have you seen in the best homes/remodels you have been in?